With the dedicated key, you can turn the projector on from anywhere in the interface: the gallery, the document viewer, in the browser or any other scenario you can think of. 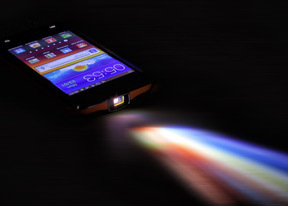 The Galaxy Beam will instantly project the contents of the display at a resolution close to nHD (640 x 360). We say close to, since the aspect of the nHD resolution is 16:9, whereas the display is 15:9, so a few pixels are left unused. Here's a demo video of the projector in action that we prepared for you. The resolution is enough for videos and even presentations (as long as the font size isn’t too small). Samsung claim that at a 2 meter distance, the image is as big as a 50″ TV. The projector isn’t very bright, so to get good results at that distance you’ll need a very dark room. In brighter lighting, you’ll need to stand closer to your screen to be able to see anything. The dedicated Projector app has a number of nice tricks that will enhance your presentation. In Quick Pad mode you can use a pointer or a pen to highlight specific bits. You can set the color and thickness of the underline. There's an eraser as well. Once activated, the Quick Pad integrates with the Notification area, so you can enable and disable the various options as you please. For example, you have activated the virtual pointer on one of the slides, but you need to turn it off to swipe to the next, where the highlighter will be used. The projector's default orientation is landscape and any content projected in portrait mode is essentially a crop. That's a waste of resolution and nHD isn't exactly plenty of pixels to work with. At this point, the dedicated projector key is in charge of rotating the screen, but we were told that it will be controlled by means of software in the final version. There's manual projector brightness setting as well as an option to disable the phone's screen when the projector is on. That's good to have when watching video. The volume keys are used for focusing at this point, but that apparently is another temporary solution to be replaced by software controls later on. Of course, we can only wish for the manual focus jog-dials in the previous two projector phones by Samsung. The volume keys also control the brightness of the torch - the dedicated Projector app has a flashlight mode too. Another option is Ambience mode - you can use it to create a heavily customized visual alarm or mood light. Essentially, you can have the phone project an image with info such as time and date at a preset time with its own repeat pattern, snooze time, fade time and a tone to go with it. The Visual Presenter mode, on the other hand, uses the camera to project whatever is in the viewfinder. The thing needs a lot of finishing touches before it's ready to launch but it looks like Samsung are trying to integrate as many options as possible. It will be interesting to see how they work out in a final retail-ready version of the Galaxy Beam. A white wall works well enough for a projection surface if you don’t have a special projection screen. This means all you need is a Galaxy Beam in your pocket and you can share your photos with a large group of people (it’s way more comfortable than everyone huddled over a small mobile phone screen), watch a movie or do a presentation in any office you walk into. The 2,000 mAh battery is rated at 3 hours of projection time, which should be good enough for either of those activities.